When embarking on a long journey it is best to keep lice out of one's underwear. If you arrive home to find your wife committing adultery, kill the adulterer and make it look like he was a burglar. Then divorce your wife. Even if one's head were to be completely cut off, he should be able to do one more action with certainty. If philosophy is your thing and you're looking for something a little different I recommend both a reading of Hagakure and a viewing of Ghost Dog to fulfill your martial arts needs for enlightenment and entertainment. Have not heard of it until this post, but it sounds good. Hi, John: I enjoyed this when it first came out on DVD/VHS video. A friend of mine recommended it so I picked up a copy at the library. Personally most MA flicks that I've seen at this point bore me to tears. I really thought it was well done. 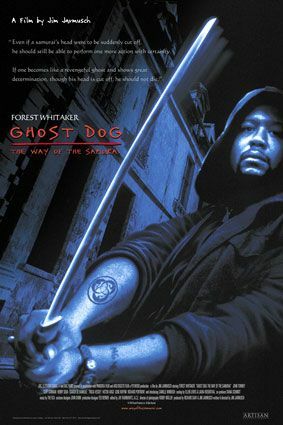 Most of my karate friends have never heard of it, but still remember Forest Whitaker from The Color of Money and Fast Times at Ridgemont High. I guess Richard Gere never though of that in his movie with Diane Lane. No, but dropping the body off at a dump is so much classier. And he got away with it!